The distribution is likely to begin on Saturday at its national and Delhi headquarters. 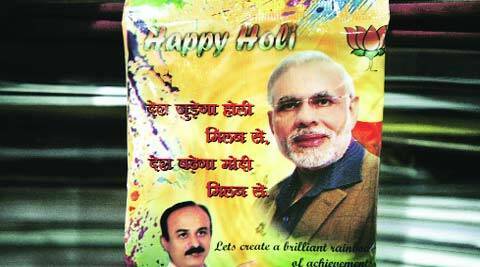 The BJP is all set to drench revellers in Modi colours this Holi. In a new marketing ploy, the saffron party has decided to distribute free packets of gulaal (colour) in the name of its PM hopeful Narendra Modi. The distribution is likely to begin on Saturday at its national and Delhi headquarters. Ashish Sood, councillor from Janakpuri, and R P Singh, MLA Rajinder Nagar, got the colours packed from a factory in Haridwar. These packets sport pictures of Modi, Delhi BJP chief Harsh Vardhan, the party symbol (lotus) and the leader who got them packaged — either Ashish Sood or R P Singh — on it. While leaders plan to distribute these packets in their respective constituencies, those interested can also collect them directly from the BJP offices in Central Delhi. Speaking to the Newsline, Sood said he would start distributing gulaal packets from Saturday. “We have ordered colours in saffron, green and white — the colours of our National Flag. With Modi’s picture on it, we expect our constituencies to take on the hues of the National Flag,” he said. R P Singh, who won the Assembly election from Rajinder Nagar, said his lot of colours will reach Delhi by Saturday. “I am in contact with newspaper distributors and these colours will reach every house in my constituency along with the morning paper. For those who do not subscribe to newspapers, I will get my supporters to personally hand over these packets so that every house will have enough colours to celebrate Holi,” he said.